Writing my second entry on disposable plastics has been somewhat of a challenge. The deeper I dig the more complex the topic appears. I decided to take a different angle on the whole topic by understanding how plastics have crept into my own everyday life. I was ‘gobsmacked’, I believe the English would say. In my first entry on disposable plastics I roughly identified two types of disposable plastics, one being all the single-use packaging/holding/utensil products we use, the second being micro plastics or ‘micro beads’. Micro beads are a fairly recent (and growing) new application of plastics, primarily used as abrasive and fiber ingredient in a range of cosmetics products, soaps, eye lash enhancers, toothpaste, hair-gel, bathing gel and what not. 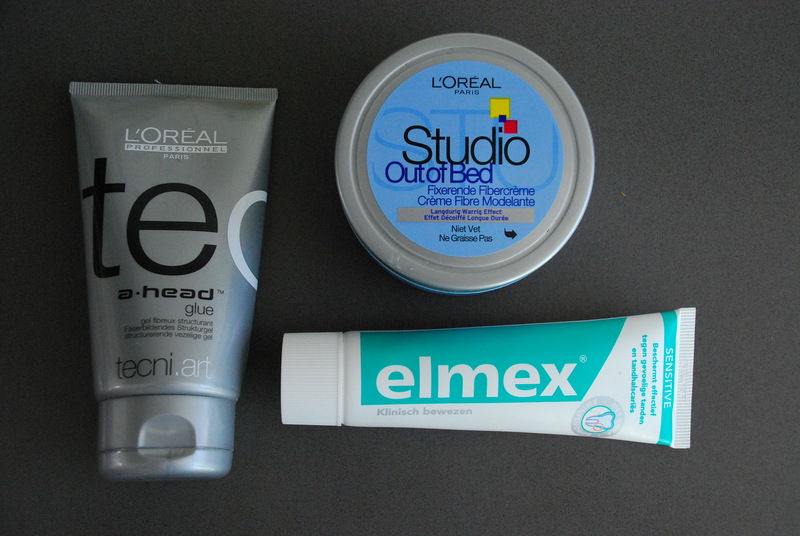 Going through my own grooming ‘range’ I quickly identified three products, ELMEX Sensitive toothpaste, containing Polyethylene (PE), L’Oreal Techni Art Glue structurising fiber gel, containing VP / VA ((VinylPyrrolidone/Vinyl Acetate), and L’Oreal Studio Out of Bed fixating fiber cream, containing PVP (Polyvinylpyrrolidone). Imagine, brushing your teeth with plastics ….. big no-no for me. Won’t be using that one any more. 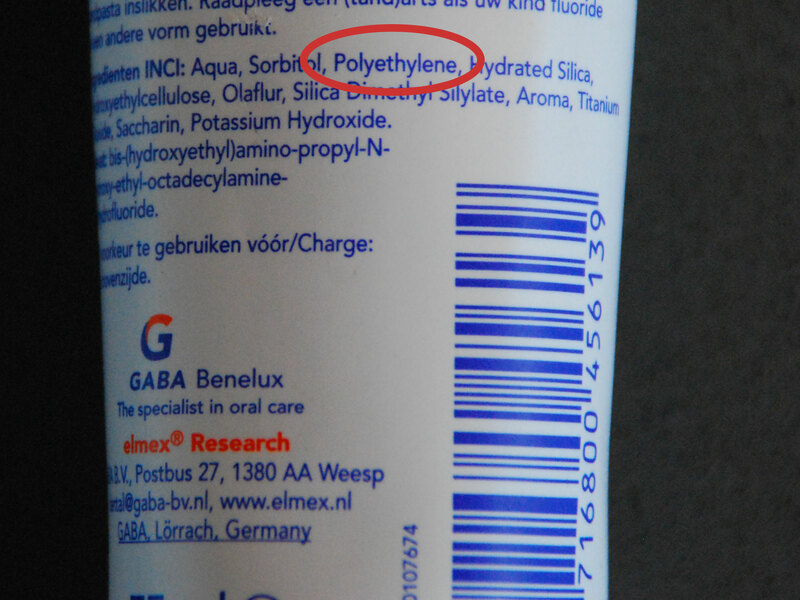 I’m mentioning ELMEX and L’Oreal not to single them out, many other cosmetics manufacturers include polymers in their product, they just happen to be in my personal grooming pallet. Happened, to be exact. In exploring directions for solutions I’d like to come back to the material -, product –, and use characteristics (and the combination of the three) I mentioned in my first blog entry. I will also discuss that these characteristics will need to be considered in relation to the environment or ecosystem they reside in. Starting with the product – and use characteristics we are talking about products in liquid form that are used for grooming purposes, for example exfoliation, brushing teeth, or modeling hair. Typically these are products that are single use, and at some point end up in your bathroom – or shower sink and into the sewage system. 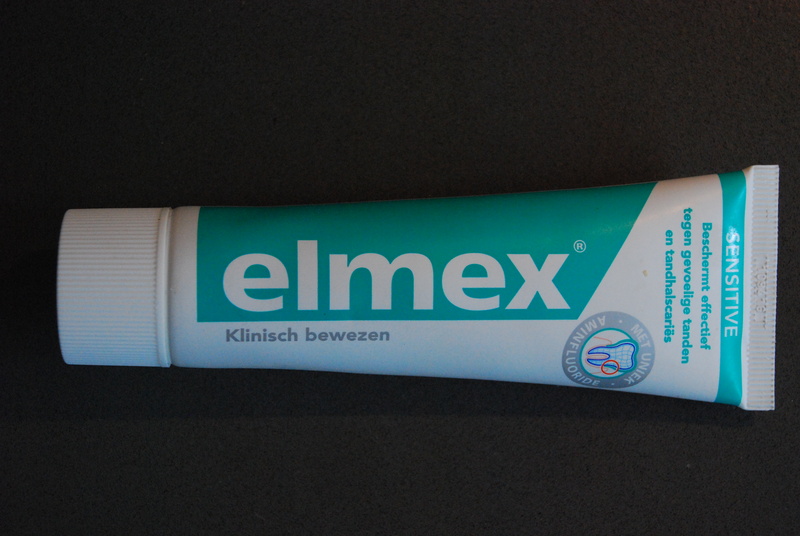 Research has established that micro beads are already present in the marine environment. The North Sea Foundation (Stichting De Noordzee) funded research by the Institute for Environmental Studies on identifying micro plastics in three samples of North Sea water. The outcome was positive. The research paper can be downloaded from their website (in Dutch). Also on their website you can find a list of products containing micro plastics or micro beads. Look at: http://www.noordzee.nl/productenlijst-microplastics/ (also in Dutch). Fendall and Sewell identified that on average each household uses one or two products containing micro plastics or micro beads (I already beat this average….) . They also identify the particle size of these plastics to be small enough firstly to not be picked up in any water/sewage purification plant and secondly to start accumulating into plankton (who feed by filtering water). You may know that plankton stands at the bottom of our food chain, so eventually we also find plastic particles back in the fish on our dinner plate. When considering the material characteristics of polymers, research on the effects of micro plastics exposure is limited. While the internet provides plenty of ‘proof’ suggesting these products are ‘not suspect’, these same sources also indicate so-called ‘data gaps’, where further research is needed or where available research may indicate certain toxicity effects. Other research has been done though on the uptake of small micro plastics in human lymph -, heart -, and vascular systems. Smaller micro plastics particles are shown to be able to ‘contaminate’ the human fetus. Further research has been done on the uptake of micro plastics into the marine environment, like lobster, blue mussel, and mussels and oysters. Plenty of research done, but given the complexity of the topic (plastics and it’s effects on human health and ecosystems) much remains to be discovered. The conclusion could be that we do not have the full picture of the effects of micro beads on ecosystems and human health. It has been established though that the marine ecosystem has been contaminated with these persistent inorganic polymers, and that the human body is susceptible for uptake of these materials (either direct or through food chain contamination). Toxicity is ‘not suspected’ according to some research and institutes, however ‘data gaps’ in research do exist. Given the available information, common sense and the precautionary principle would indicate that introducing plastics into the natural environment is not desirable by any standard. In the previous paragraph I established that product – and use characteristics offer no leads for resolution. Because of the product (liquid) and use (single use, ends up in the sink) it is not effective to invest time in ‘closing loops’. For micro beads in cosmetics and grooming products the issue (and it’s solution) really lies on the materials level, and should be addressed there. In the short-term I believe substitution of micro beads for natural materials is the only way to effectively address the ecosystem – and potential health risks. And this is not impossible. In fact, micro beads replaced perfectly natural products like pumice, roughly grained oatmeal, and apricot or walnut husks during the late 90’s. Replaced because of cost advantages of up to a factor 10. Let’s substitute (back)! With this notion I’m not saying we should stop using micro beads all together, I’m only making the point not to use it as ingredient in these cosmetic products, where the product chain cannot be closed effectively and the material itself is a pollutant. If responsible recycling can be ensured (for instance recycling of micro beads in pillows) the risk is much reduced. The introduction of product responsibility will need to require product manufacturers to apply the precautionary principle and carefully consider the combination of material -, product -, and ‘use’ characteristics. Product – and chain – design should facilitate either (1) recycling in a technological chain or (2) a positive impact within the biological chain. Designing for a positive impact within the biological chain, i.e. to design the ecosystem and ‘facilitate’ biodiversity is a huge task and complex to accomplish. Impact assessment is a challenging new area of expertise and knowledge to be discovered, as measuring impact not only depends on understanding material -, product -, and use characteristics. Positive impact depends on the product in relation to the location in which it is used. Understanding location and scales of impact will be key to developing ‘good’ products in the future. In my view, environmental awareness understood in this way will be key for companies moving forward. In the case of micro plastics as ingredients in cosmetics products there is little that can be done to create a closed technological loop. It flushes through the sink. Hence I think the action here should be on substitution at a material level. The question remains, whether it can be left up to companies to make a (partly ethical) common sense evaluation of whether it is in the long-term public interest to use these types of ingredients in cosmetics products. This week I found myself questioning the compatibility of liberal market economy with sustainable behavior. I was listening to a speech of the Head of Corporate Sustainability of AKZO Nobel. Interesting speech but towards the end he made a plea for politics to get moving on creating and enhancing a ‘level playing field’ for sustainable development. I found the remark rather out-of-order. This kind of ‘old school’ thinking may work in the short run, with government requiring the substitution of plastics from cosmetics products. However, frameworks and laws will always be too little too late. It’s always about trying to put fences around ‘the unwanted side-effects’. What if we focus our attention more on having a positive influence? Consumer platforms (like ‘Nudge’ in The Netherlands) can play a key role in creating consumer awareness, changing lifestyle, and helping product manufacturers recognizing the alternative business opportunity. Would you substitute your plastic – for a natural hair gel if it would cost 10 cents or so more, but is not causing cost to explode down the line, because we need to clean-up the mess in our oceans? I would and am! This is a medium term effect though. In the long run though companies will need to start recognizing both their dependency and impact on natural ecosystems. The introduction of product responsibility, i.e. designing the product chain in terms of material -, product -, and use characteristics in relation to location is an important step towards this end. This also means that the same product in different locations may be good or bad. The world is NOT homogeneous, even if our liberalized markets would love it to be. Some companies are starting to understand this relationship, also because for some loss of biodiversity and pollution actually hurts the bottom line. I can only hope more companies will gain the same understanding. In my next blog entry I will be focusing on the other category of disposable plastics, the single-use packaging/holding/utensil products and explore some of the options for short-term and long-term actions. Fendall, KL.S., en Sewell, M.A. : ‘Contributing to marine pollution by washing your face: Microplastics in facial cleansers’, Marine Pollution Bulletin, Vol. 58, No. 8, August 2009, pp. 1225-1228. Thank you for pointing out that small particles end up inning consumed by fish, and then by people. It definitely makes you think about what we pour down the drain! By the way, you and your readers should be aware of http://www.ewg.com. Their cosmetics database http://www.cosmeticsdatabase.com is very helpful — and illuminating! They cover soap, shampoo, makeup, and sunscreens. I’m not in any way affiliated with them; I just appreciate what they go. wow, yet another way Pharma is hitting us, in particularly nasty way with zero forethought to the Earth’s ecology… never even thought of this one.